Tomorrow I've got a stall at the bi-monthly craft fair run by Of Cabbages And Kings, up in North London. I haven't done anything like it since before Christmas, and am half excited and half thinking I-hope-I-sell-enough-to-make-it-worth-sacrificing-half-the-weekend. So mixed feelings (and in fact a lot of the excitement comes from the anticipation of making and devouring a packed lunch)! 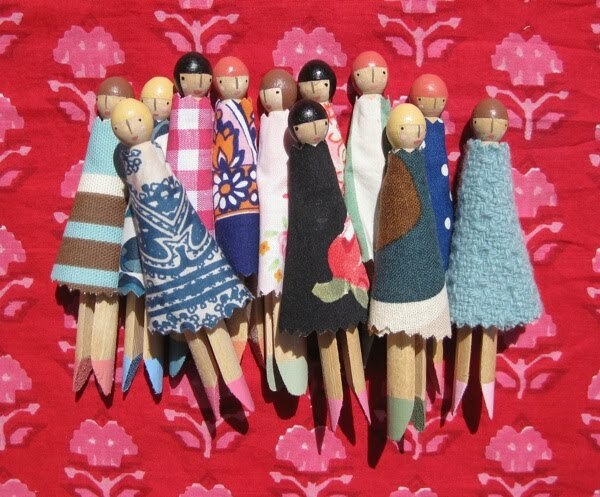 These are some peg dolls that I made last weekend for the occasion (quite a few of their dresses are tiny pieces of what were were human-sized dresses).